The Corporate Research Associates daily tracking poll for The Chronicle Herald shows little movement as the campaign in Nova Scotia progresses. And the only small movement it does show is away from the incumbent government and the third place Tories and towards the Liberals of Stephen McNeil. I wrote about the state of the race and the election projection in this week's article for The Globe and Mail, and I invite you to check it out. Since the last major update on this site, the projection has swung rather significantly in the Liberals' favour. The party is now projected to take 50.3% of the vote, up 4.8 points from where the Liberals stood with polling up to Sept. 18. That gives them a 23-point lead over the New Democrats, and even their likely low range still puts them 21 points up on the NDP. Stretched to its extreme, the Liberals would still win by 10 points even if the polls fall on their face as they have in recent elections. The New Democrats have slipped 1.1 points to 27.3%, while the Progressive Conservatives have dropped 3.1 points to 20.1%. They seem to have bit hit hardest by the gains McNeil has made during the campaign so far. The Liberals are projected to win between 30 and 38 seats with these numbers, up from between 25 and 34 from Sept. 18. That puts them comfortably in majority territory. Their absolute minimum at this stage is 25 seats - not enough to win a majority, but enough to win the election. Darrell Dexter's New Democrats have dropped to between 13 and 16 seats from between 14 and 21, and their maximum range (23 seats) now puts them below the Liberals. 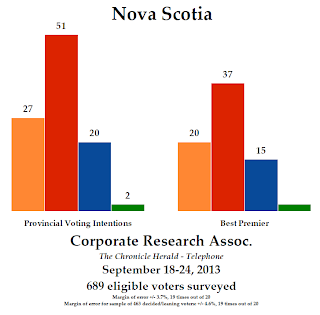 CRA polling does not support the potential for an NDP upset if the election were held today. The PCs have dropped from between 3 and 7 seats to between 3 and 6, but more importantly their most likely result has dropped by three seats to only four. The Liberals picked those up, along with another seat from the NDP. The Greens have dropped 0.9 points to 1.3%, and are expected to take between 0.9% and 1.3% of the vote. This is after taking into account their slate of only 16 candidates out of a possible 51. Because they have not managed a full slate, the likelihood of the polls over-estimating the Greens is amplified significantly, even if the tracking polls give them just 2% of the vote. The most recent set of numbers from CRA, running from Sept. 18-24, is almost an entirely new sample from the analysis of last week (the polls overlap only for Sept. 18). They show no statistically significant movement over the last week, suggesting that the campaign is relatively stable. But the trends are pointing in the direction of the Liberals: they have picked up three points to hit 51% support, the highest they have been in CRA polling for as long as I can recall. The New Democrats have slipped one point to 27%, while the Progressive Conservatives have dropped three points to 20%. On leadership, McNeil gets 37% (+2) on who would make the best premier, followed by Dexter at 20% and Jamie Baillie of the Tories at 15%. That is a drop of four points, just flirting with the margin of error. The campaign has not been going very well for Baillie, though the reviews of last night's debate were relatively positive for the PC leader. Nevertheless, McNeil's leadership edge is rather crushing. The recent election misses in B.C. and Alberta, for example, showed nothing like this. Each dot in the chart below represents a result from a poll that was in the field on that particular day. As CRA's polling spans a week, we cannot know for certain when movement is taking place. But this sort of tracking gives an idea. As you can see, the campaign so far has been pretty steady. The Liberals started the campaign at 48% before dropping to 47% and then upticking to 49% and now 51% support. Meanwhile, the NDP has wobbled between 27% and 29%, while the PCs have been pretty steadily sinking, from 23% to 21% and now 20%. The consensus opinion on the debate last night was that all did pretty well, but Dexter and Baillie performed better than McNeil. But it doesn't seem like these were the kinds of performances that should single-handily change the game. We won't start seeing the effect of the debate until the weekend, when CRA's sample starts leaning post-debate. It will be interesting to see if things shift, because at this stage of the race the Liberals are going to win in a landslide. 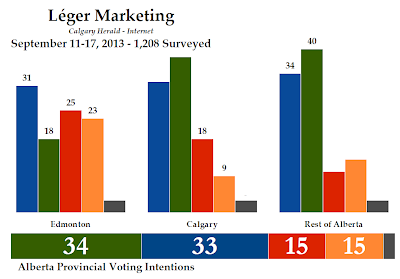 The Calgary Herald reported on the latest numbers from Léger Marketing for the provincial scene in Alberta over the weekend, showing that the governing Progressive Conservatives and the opposition Wildrose are nearly tied, as Premier Alison Redford's approval rating experiences a significant uptick. Léger was last in the field in mid-April and since then the PCs have picked up four points to come to within a point of Wildrose with 33%. Danielle Smith's party has dropped three points to 34%, while the Liberals were down two points to 15% and the New Democrats were up one point, also to 15%. None of these shifts were outside the margin of error, or would be if this was a probabilistic sample (Léger has moved to an online panel for its Alberta polling - they used live-callers in the 2012 election). About 22% of the entire sample was undecided. For the Progressive Conservatives, this is a bit of a comeback as they had taken a serious hit earlier in the year. The New Democrats seem to be a on a roll as well, going from 13% in Léger's January poll to 14% in April and 15% now. 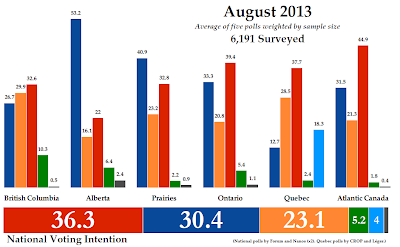 That is still within the margin of error but the trendline is positive for the NDP. The report in the Herald contained partial regional results. The ones that were mentioned are identified with numbers in the chart above. The bars without a number are my own estimates, though the report in the Herald does mention a six-point lead for Wildrose in Calgary, which is also replicated outside of Calgary and Edmonton. Update: A commenter has pointed out that the regional results were tweeted out by one of the Herald's reporters. The missing information for Calgary is 38% for Wildrose and 32% for the PCs, exactly the same as my estimate. In the Rest of Alberta, the NDP was at 15% and the Liberals at 8% (I estimated a 13-10 split above). Edmonton remains the most hotly contest part of the province, with the PCs leading at 31%, followed by the Liberals at 25%, the NDP at 23%, and Wildrose at 18%. They dropped nine points in the city. Using the available regional data, and making inferences for the unavailable numbers, the model gives 40 seats to Wildrose and a minority government. The Progressive Conservatives would take 28 seats, while the Liberals would win 11 and the NDP would take eight. Wildrose wins almost all of its seats outside of Edmonton, while the Progressive Conservatives win more than half of theirs in Edmonton. The Liberals take 10 of their 11 seats in the two cities, while the NDP wins seven of their eight in the provincial capital. The real movement in this poll, however, was Redford's. Her approval rating jumped six points - outside of the margin of error - to 32%, while her disapproval rating fell eight points to 52%. That still puts her behind Smith, though, whose approval rating improved to 41% against 37% disapproval. Raj Sherman of the Liberals and Brian Mason of the NDP had an approval rating of 30% apiece, generally where they have been throughout 2013. The cause of Redford's increase appears to be linked, in part, to her handling of the flooding in the province earlier this year. Fully 84% of respondents rated her handling of it from fair to excellent (50% good or excellent). It seems to have helped regain some trust, though her party is still hobbled. The next election is almost three years away, however, so the Progressive Conservatives have plenty of time to right the ship and continue their generations-spanning hold on government. But Smith remains popular. If she can get her party looking government-ready and avoid the mistakes of the 2012 campaign, she should still be a real threat to the Tories in 2016. 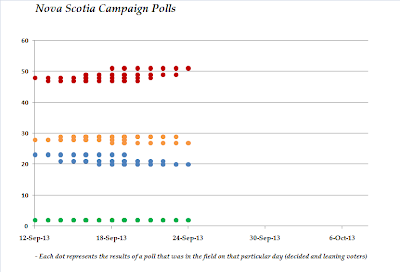 The first polling numbers for the provincial election campaign in Nova Scotia were released yesterday. The poll by the Corporate Research Associates for The Chronicle Herald shows that Stephen McNeil's Liberals have extended their lead over the governing New Democrats as the campaign kicks-off. The projection accordingly puts the Liberals on track to win a majority government. The Liberals have picked up 4.8 points in the vote projection since the last update incorporating polling data up to Aug. 31, and now lead with 45.5% support. The New Democrats have dropped 2.4 points to 28.4%, while the Progressive Conservatives are down 1.6 points to 23.2% support. The likely vote ranges give the Liberals between 43.7% and 50% support, compared to 28.4% to 31.2% for the New Democrats and between 21.3% and 24.6% for the Tories. As even the maximum and minimum ranges of the Liberals and NDP do not overlap, this suggests that the Liberals should be able to win the popular vote unless a historic degree of polling error occurs. From a flimsy minority, the Liberals have moved into a comfortable majority. The projection model gives the Liberals 30 seats with these numbers, a gain of eight since Aug. 31. The NDP has fallen six seats to 14 and the PCs have dropped two seats to seven. But a majority government is not completely in the bag for McNeil: the likely range still puts him as low as 25 seats, one short of a majority. His upper likely range is a far larger majority of 34 seats. The New Democrats would be likely to win between 14 and 21 seats with these levels of support, while the Tories could expect to win between three and seven seats. The maximum range for the New Democrats, however, does put them ahead of the Liberals' minimum range. This means that if the polls completely miss the call and the gap narrows to some four points, the NDP could pull more seats out of the equation. But the Liberals remain firmly in control of the situation. 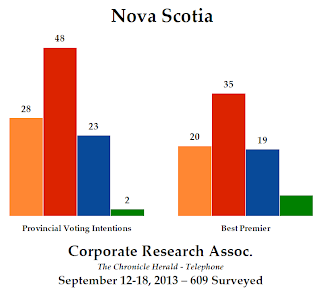 The CRA poll gave the Liberals 48% support among leaning and decided voters in Nova Scotia, a gain of seven points from the firm's last poll of Aug. 8-31 (which excluded leaners). That is a statistically significant increase in support, so it would appear that the campaign has gotten off to a good start for McNeil. The New Democrats were down three points to 28% and the Progressive Conservatives were down two points to 23%, both shifts within the margin of error. The Greens were down one point to 2%. Of the entire sample of eligible voters, 22% were undecided. The margin of error for the entire sample is +/- 4.0%, 19 times out of 20, and is +/- 4.9% for the sample of decided and leaning voters (406 of them). McNeil picked up five points on who would make the best premier with 35%, putting him well ahead of Darrell Dexter's 20% and Jamie Baillie's 19%. This will be an interesting number to keep an eye on. In British Columbia, for example, Christy Clark was making bigger gains on this question than her party was in the final weeks of the campaign. Support for John Percy of the Greens for premier was not mentioned in the Herald report on the poll. The Chronicle Herald is promising regular, daily updates on the polls in Nova Scotia. It will be interesting to see how this is handled as we have not seen daily tracking in any provincial campaign since New Brunswick's 2010 election. I encourage the Herald to be as copious with the data as possible. Their first report was missing a few bits of information that the Election Act requires, namely the field dates of the poll itself, but hopefully that will be rectified in the future. For the purposes of transparency and disclosure, it would be ideal if The Chronicle Herald released full data reports of their polls after a reasonable delay. After all, once the headlines are written that data is not worth very much anymore and of interest just to us wonks. In any case, it seems that the race remains the Liberals' to lose. Support for the three parties has been generally wobbling back and forth for a long time now, and it is certainly not good news for the government that the gap is shrinking as the campaign begins. The opposite happened in British Columbia. We will see whether this race will perk up a little in the coming weeks. Two polls of the provincial voting intentions of Quebecers showed that the race between the opposition Liberals and the governing Parti Québécois is tightening up, after the PLQ enjoyed a wide lead after Philippe Couillard's leadership victory. But is it enough to entice Pauline Marois to pull the plug on her government? 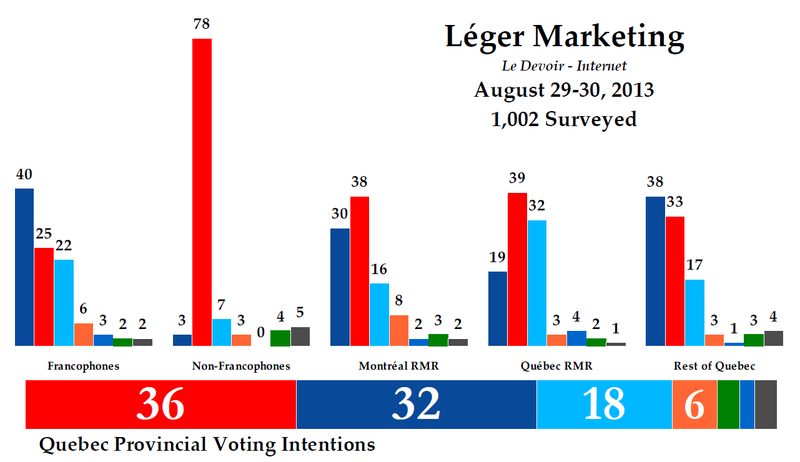 Léger Marketing was in the field Aug. 29-30, giving us a good indication of how voting intentions are moving amid the charter controversy. They suggest they are not moving very much, with the Liberals unchanged at 36% and the PQ up one point to 33%. The PQ's gain is within the margin of error (or would be with a probabilistic sample), but the party is up from the 27% it had back in June. The Coalition Avenir Québec was also stable at 18%, while Québec Solidaire made a three-point gain to hit 9%. That is a significant shift, though it puts QS back to where it was before their recent dip. Support for the Greens was down one point to 2%, while support for other parties was also at 2%. Of the entire sample, 4% were undecided and 9% gave no response or said they would not vote. Note that Léger's report did not remove the undecideds, with the exception of the province-wide sample. In the chart above, I have done so. If the purpose of pushing the Charter of Quebec Values at this moment - it was an electoral promise, after all - is to try to galvanize the PQ support, the party has been partly successful. At 33%, the PQ is above where it was on election night in 2012 and it puts them in range of the PLQ, particularly in the seat count due to their lead among francophones. But if the purpose was to propel them into a majority government, they seem to have fallen short of that. And the Léger poll suggests support for the charter is dropping, meaning the PQ may be at a high watermark. This was a very large poll by Léger, and they broke it out into multiple demographic and regional groups. Among francophones, the PQ continued to lead with 39% (this is where they have made most of their gains over the summer), while the Liberals were up to 28%, the CAQ was down to 20%, and QS was up four points to 10%. Among anglophones, the PLQ was way ahead with 74% to 9% for the CAQ and 7% for the PQ, while among allophones the Liberal lead was cut to 60% against the PQ's 15% and the CAQ's 13%. It is interesting to note that the PQ's support has not disappeared among allophones, the group most affected by the charter. Regionally, the Liberals led on the island of Montreal with 42% (down three points from the election, though) and in Quebec City with 39%, while they were tied on the Rive-Nord (the suburbs north of Montreal) with the PQ at 36% and were ahead in western Quebec with 36% as well. The PQ was ahead in eastern Quebec with 42%, central Quebec with 33%, and the Rive-Sud with 35%, while the CAQ had its best numbers in Quebec City (27%) and central Quebec (28%). Québec Solidaire was at 14% on the island of Montreal, up two points from the election. Using Léger's regional data, the projection model gives the Parti Québécois 60 seats, short of the 63 needed to form a majority government. The Liberals take 55 seats, the CAQ gets eight, and Québec Solidaire holds their two seats. The PQ would need to be doing better in the suburbs of Montreal in order to have a shot at winning a majority government - being effectively tied with the Liberals will not do. For the PLQ, they need to pull more seats out of their francophone vote - trailing in central Quebec, the best francophone region for the party in the last election, is problematic. Speaking of problematic, Forum Research also released some provincial numbers earlier this week. But the firm, and The National Post report, did a very poor job of interpreting the results, chalking up the Liberal lead to the charter despite not having been in the field since the last election. Forum has no way of knowing whether the charter is the reason for the PLQ's lead, as they do not know where the PLQ stood before the charter was revealed. And since other polls suggest that the Liberals had an even wider lead than seven points earlier this year, it seems doubly wrong to credit something that has happened in only the last few weeks. Forum also says that the PQ is 'suffering' from the charter, despite being three points up on their electoral performance of 2012. And the report in the Post put the same angle on the poll. It is disappointing, and appears to have continued with Forum's federal results: crediting the charter with boosting the Trudeau Liberals despite the party being down two to four points in Quebec from where they stood in Forum's polling before the charter was announced (or even rumoured at). This provincial poll itself is not entirely unusual, with the PLQ at 42%, the PQ at 35%, and the CAQ at 12%. For the Liberals and PQ, those numbers are not too far from some of the recent polls by CROP and Léger. For the CAQ it is a tad low, but that could be a sampling issue. The Forum report suggests that 38% of respondents said they voted for the Liberals in 2012, while 35% said they voted for the PQ (as opposed to the actual result of 31% and 32%, respectively). While it would be better if the sample was more representative, these numbers are not as troubling as the 14% who said they voted for the CAQ - almost half of those who actually did. If we weigh Forum's numbers by how people voted in 2012, we get 41% for the PLQ, 31% for the PQ, and 18% for the CAQ, which makes a lot more sense. The linguistic divide is also odd, with the PLQ at 38% among francophones. That is an amazing number for the PLQ. That puts them ahead of the PQ, which stood at 37%. Among non-francophones, the PLQ had 87% to 6% for the PQ. But these numbers don't add up very well - if we weigh Forum's numbers according to the demographic profile of Quebec (roughly 80% francophone, 20% non-francophone), we get a result of 48% for the PLQ and 31% for the PQ. It is not very clear how Forum came to 42% to 35% split with these numbers - the proportion of francophones would have to be more than 90% of the final weighted numbers for it to work out. Nevertheless, using Forum's regional numbers (which appear quite reasonable), the Liberals would be capable of winning a majority government - but only just. They'd take 63 seats to the PQ's 57, while the CAQ would be reduced to just three seats and Québec Solidaire would win two. Taken together, what do these polls tell us? Certainly, that the race is increasingly between the Liberals and the Parti Québécois. The CAQ is falling back to ADQ levels of support, which condemns them to being in the running for less than 10 seats. Depending on how the vote breaks down, and particularly how francophones are leaning, the Liberal lead is generally not wide enough to ensure a majority victory, while the PQ's deficit is not small enough to give them a good chance of winning a majority themselves. It makes it difficult to guess at what Marois will do going forward. There isn't much here to base an electoral roll of the dice upon, but things could get worse before they get better. The latest federal numbers from Harris-Decima were released on Friday via The Canadian Press, showing that Justin Trudeau's Liberals continue to hold a lead over the Conservatives and that stability ensues in Canadian politics. We have not heard from Harris-Decima since immediately after Trudeau's leadership victory. Since that poll, which was conducted in the last two weeks of April, none of the parties have experienced a statistically significant shift in support. The Liberals were down two points to 33%, the Conservatives were up one point to 29%, and the New Democrats were up two points to 24%. The Bloc Québécois was unchanged at 6%, while the Greens were down one point to 6%. Support for other parties was approximately 3-4%, based on the leftovers from Harris-Decima's report. So Harris-Decima agrees with virtually every other pollster that things have been generally holding steady for the last five months. But Harris-Decima polls continuously, releasing numbers to CP periodically. This is shown by the tracking charts that accompany Harris-Decima's reports. The cropped version of it to the left, showing national support since mid-April, gives an indication of how things have been moving in Harris-Decima's polls. It generally shows stability with a few blips here and there - the Liberals managed over 35% support a few times, but have also been as low as about 30%. The Conservatives, meanwhile, have not broken 30% while the NDP has not broken 25%. Considering that you expect a little wobbling back and forth in polling, this suggests that voting intentions have been holding steady. That is the case in most regions of the country, at least in terms of where things have moved since April. There were no shifts larger than a single point in Ontario, where the Liberals led with 38% to 33% for the Tories and 20% for the New Democrats. Atlantic Canada showed no statistically significant shifts either, with the Liberals at 44%, the NDP at 30%, and the Conservatives at 19%, and the Prairies were similarly steady: 45% for the Tories, 26% for the Liberals, and 23% for the Prairies. There was more movement in Quebec, where the Liberals dropped to 32% and the Bloc Québécois stood at 25%. The NDP was at 23% while the Conservatives were up five points to 14% support. In British Columbia, the Conservatives were up 11 points to 33%, followed by the NDP at 29% and the Liberals at 28%. The Greens were at 10% support in the province. Alberta had the most movement, though it is probably just an anomaly. Harris-Decima had the Conservatives down 13 points to only 45% support in Alberta, while the New Democrats were up 19 points to 26%. The Liberals were at 20% support. These numbers make Alberta a very competitive province - assuming these numbers occurred in an election, the Liberals could win three seats and the NDP could win four, leaving just 27 for the Tories. It is difficult to believe that it could actually happen, but this is what might if the numbers province-wide looked like this. It wouldn't prevent the Conservatives from pulling more seats out of the equation with fewer votes, however. They would likely win around 126 seats, compared to 123 for the Liberals, 54 for the New Democrats, 33 for the Bloc Québécois, and two for the Greens. It is possible, though, that the Liberals could be under-estimated in Quebec if their support is distributed more broadly outside of Montreal. That has the potential to cut the Bloc seat count down by a few seats, putting the Liberals narrowly ahead of the Conservatives nationwide. They might not necessarily need the extra seats, though. With a combined 177 seats, the Liberals and NDP would have a working majority. Whether they could make that majority work, however, is another question entirely. So, steady as she goes in Canada as we get into what is looking like a tumultuous fall session. But the Liberals have to be happy they have been holding the lead for as long as they have been - it puts Trudeau's performance above those of his two predecessors in the office. And they have just two more years to go. The latest numbers from Abacus Data, released to Sun Media on Tuesday night, caused a bit of a stir. They put the three parties in a tight three-way race and placed the Conservatives narrowly ahead for the first time in any poll since Justin Trudeau became Liberal leader. But though the poll differs from the consensus opinion on where the parties stand, it is in complete agreement in terms of which direction they are heading. That consensus opinion is reflected by ThreeHundredEight's current polling averages, which still give the Liberals a four-point lead even after including Abacus's findings. But Abacus was last in the field in mid-June, like the other firms that have recently reported. And like those firms, it shows that nothing of real consequence has happened over the summer months in the polls. 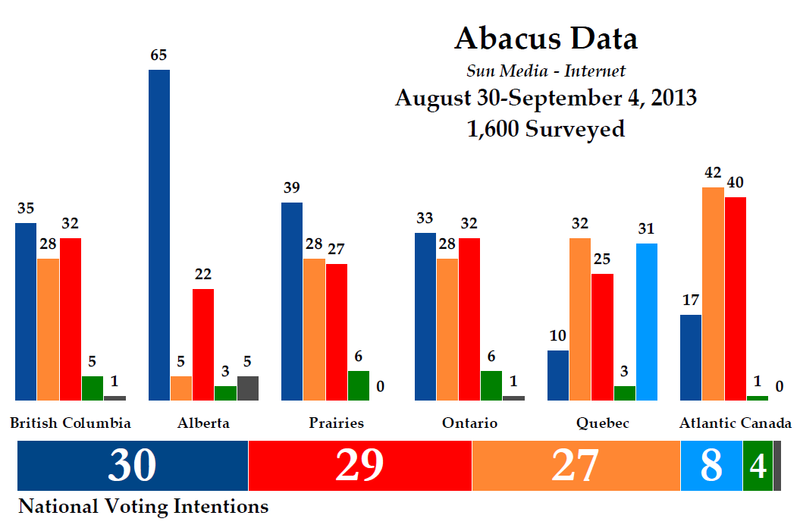 Since that June poll, Abacus finds the Conservatives gaining three points to sit atop the table with 30%, while the Liberals were unchanged at 29% and the New Democrats were up one point to 27%. All of these shifts in support appear insignificant, assuming a probabilistic sample. The one change that was outside the theoretical margin of error was the fall of the Greens by six points to 4%, though that puts them at a far more reasonable level of support than June's 10%. The Bloc Québécois was up two points to 8%, while 1% said they would vote for another party and 22% were undecided. It is clear that Abacus differs from what the other polls are showing in terms of actual support, but the trends are similar. That is, perhaps, more important than where the parties actually stand. Why Abacus has been consistently at odds with other pollsters since the beginning of 2013 is less clear. Abacus found the Conservatives ahead by two points among men and the NDP ahead by five points (the Liberals were second) among women. The New Democrats had the edge among voters between the ages of 18 and 44, the Conservatives had a wide advantage among voters between the ages of 45 and 59, and the Liberals were narrowly in front among voters 60 and older. The large national sample reported by Abacus is deceptive, as it over-sampled Ontario (note that Abacus releases complete weighted and unweighted results, including for all respondents and committed voters, and kudos to them for that). This was re-weighted accordingly, but it means that the samples outside of Ontario are quite small. This leaves those numbers vulnerable to wider variations, which did indeed occur. In British Columbia, the Conservatives led with 35% while the Liberals were up 15 points since June to 32%. The NDP fell to 28%, while the Greens were down 17 points to 5%. The Conservatives increased by 15 points to 65% in Alberta. The Liberals were up to 22% and the NDP was down 16 points to 5%. There was less statistically significant movement in the Prairies (39% for the Tories, followed by the NDP at 28% and the Liberals at 27%) and Atlantic Canada (42% for the NDP, followed by the Liberals at 40% and the Conservatives at 17%, a result that is significantly at odds with other surveys). Ontario, which had a large sample of 784 decided voters, also showed stability: the Conservatives were ahead with 33%, followed by the Liberals at 32% and the NDP at 28%. The over-sample meant Abacus was able to give good-sized regional breakdowns: the Liberals were narrowly ahead in Toronto, with 36% to 34% for the NDP, and eastern Ontario, with 36% to 34% for the Tories. The Conservatives were well in front in the GTA, Hamilton, and central Ontario regions with 42% to 30% for the Liberals, and were slightly ahead in southwestern Ontario with 31% to 30% for the Liberals and 29% for the NDP. The New Democrats led only in the north, with 44% to 28% for the Liberals. But Quebec was the most interesting result. Being an important electoral battleground for the NDP and Liberals, the unusual result is worth noting. 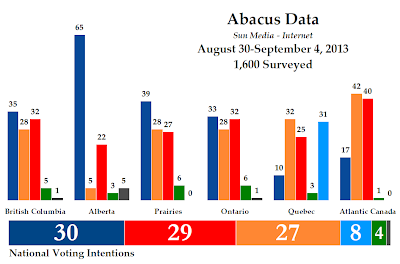 Abacus gave the New Democrats the lead with 32%, one of the few polls to do so since Trudeau became Liberal leader. But unlike those few other examples, it was the Bloc Québécois that placed second with 31%, followed by the Liberals at 25%, a drop of nine points. The Conservatives had just 10% support. Is this about Quebec's Charter of Values? It is popular among francophones, and both Trudeau and Thomas Mulcair have come out against it (the Bloc's support has been tepid, but that would have only been known after this poll was conducted). But Trudeau's opposition was much stronger than Mulcair's (at least, it was when this poll was done) so it follows that the NDP may have regained some support. But it could just be a coincidence. Both Léger and Abacus were in the field at similar times recently and in June, making it useful to compare their numbers. The numbers themselves are quite different for the Liberals and Bloc, with Léger having given the Liberals 46% in June and Abacus only 34%, while the Bloc was at 15% and 23% in the two polls. The numbers are still different now, with the Liberals at 35% according to Léger and 25% according to Abacus, while the Bloc is at 23% and 31% respectively. But the trends are almost identical: the Liberals slipped 9 or 11 points, the NDP gained five or six, and the BQ was up eight. Are we looking at an emerging trend? In terms of seats, the Abacus poll would deliver the Conservatives a greater advantage than their one-point lead would suggest, with 123 seats to 95 for the Liberals and 87 for the New Democrats. With the heated language we've heard from the NDP concerning the Liberals lately, it is hard to imagine them working together. But their combined 182 seats would give them the ability to form a working majority government, despite the Bloc's 32 seats. Of note, these poll numbers (and the new boundaries) would give the New Democrats five seats in Saskatchewan, generally considered the best case scenario for the party in the province (they held their caucus meeting there this week, and much was made of their potential for gains). Mulcair did mention hoping to win a majority of seats in Saskatchewan, a reasonable hope to express for a party wanting to form government, and perhaps not as unrealizable as some have suggested. By my reckoning, at these levels of support the NDP is within range of another two seats, which would give them half of the province's 14 seats. Winning an eighth seat, though, would be very difficult. But though the poll does have some good news for the New Democrats (Within-the-margin three-way race! Leads in Quebec and the Atlantic! Strong numbers in Ontario! ), they should be as reluctant to take this poll without a grain of salt (a phrase I have come to loathe) as the ones that have put them well behind the two other parties. Abacus is showing a consistent trend with the other pollsters, suggesting that they are not discovering a new political landscape that will be borne out in other surveys. And that suggests that, though there are a few dissenters, the Liberals are probably still ahead. The Corporate Research Associates released their quarterly provincial poll numbers for Newfoundland and Labrador last week, showing that the Liberals have moved ahead in the province, displacing the New Democrats. But another poll by Abacus Data for VOCM suggests that the NDP has also slipped a little in St. John's, giving the Liberals a decent shot of winning a majority government if an election were held today. CRA was last in the field in May, and since then the Liberals gained five points to hit 41% support, the highest they have been in a very long time. The New Democrats were down four points, still a historic high considering that the party had never won more than a single seat in a general election before 2011, while the Progressive Conservatives were down one point to 26% support. None of these shifts were outside the margin of error. But the poll suggests some on-going trends in the province: the governing Tories have been falling steadily since last November, when they were at 46% support. The New Democrats have been dropping since February, when they were at 39%, while the Liberals have been gaining since then. They were at only 22% in February. 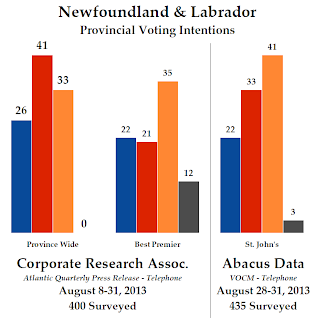 Abacus Data shed some more light on the race in St. John's, polling more people in that city than CRA did in the entire province. Abacus found the New Democrats to be leading in the capital with 41% support, representing a four point drop since the 2011 election. The Liberals placed second with 33%, a gain of 26 points, while the PCs have fallen 25 points to only 22% in the city. This suggests that the NDP has been generally treading water, while PC voters have swung heavily over to the Liberals. The poll gives the NDP the advantage among women (14 points) whereas it is much closer among men (two points). The NDP led among voters in the city between the ages of 18 and 59, while the Liberals were narrowly ahead among older voters. The New Democrats had an 11-point edge in the outskirts of the city (Wards 1, 4, and 5) but were ahead by only five points in the city centre (Wards 2 and 3). With CRA's numbers, however, the eight-point Liberal lead is not enough to win an outright majority. The party would likely win 24 seats, half of those at stake, with almost all of them coming west of the Avalon and Burin peninsulas. The New Democrats would win 19 seats, almost all of them in and around St. John's, while the Tories would win just five seats. Of course, this is close enough that only a few errors would tip the balance of power. But if we apply Abacus's St. John's numbers specifically to the ridings in that city, we see that the Liberals are in a much stronger position. The Liberals have boosted their support enough in St. John's to take three of the city's eight ridings, increasing their overall seat count to 27 and reducing the New Democrats to 16. That is a majority government for the leaderless Liberals. How the numbers will move once the Liberals do select their next leader will be interesting to see. CRA found that Lorraine Michael, leader of the NDP, is by far the most popular leader in the province: 35% said she would make the best premier, compared to 22% for current premier Kathy Dunderdale and 21% for interim Liberal leader Eddy Joyce. That makes Dunderdale about as popular as her party (when we remove the undecideds and none-of-the-aboves), Joyce much less popular, and Michael much more. If Newfoundlanders and Labradorians like the new Liberal leader, the party would appear to still have some potential for growth. The government, though, is in dire straits. Dissatisfaction has increased to 64%, almost double where it was a year ago. Satisfaction has accordingly been cut almost in half to only 31%. Only 3% of residents said they were completely satisfied with the government. To put that in some context, 12% were completely satisfied this time two years ago, and that was at 38% when Danny Williams resigned as premier in 2010 (90% of Newfoundlanders and Labradorians were completely or mostly satisfied at the time). Though Dunderdale and the PCs do still have two years to turn things around, it could be that voters in the province have already decided it is time for a change. It was looking dry for a little while, but in the end three national and two Quebec federal polls were conducted during the month of August, interviewing some 6,000 Canadians. The results show that the Liberals have re-gained a comfortable lead after an anomalous July. Last month was anomalous in that only two polls were conducted, making it difficult to measure the trends. And August itself was still relatively sparse, so I'll go over the averages briefly. The Liberals led with an average of 36.3% support in August, up 3.9 points from July and their second-best monthly score since at least the 2008 federal election. The Conservatives were up 0.9 points from July to 30.4%, still keeping their current level of support below anything that has been recorded since, again, at least the 2008 election. The New Democrats, who have been stagnant since April, were up 0.3 points to 23.1%. The Greens were down 1.3 points to 5.2%, while the Bloc Québécois was down 2.6 points to 4%. An average of 1.1% of Canadians said they would vote for another party. If we compare the polls from Nanos and Forum to the last time these two firms were in the field (doubling Nanos, since they were in the field twice in August), we see that the parties have hardly budged since June. The Liberals have gained 0.8 points in polling from Forum and Nanos since June, while the Tories were up 0.6 points and the NDP was down 0.3 points. Hardly anything to get worked up about. Regionally, the most interesting result comes in British Columbia. There, the Liberals have managed their best result in at least 4.5 years, while the Conservatives have scored their lowest in that period of time (32.6% and 26.7%, respectively). The Liberals were also leading in Ontario, Quebec, and Atlantic Canada with upticks across the board (except Alberta). The Conservatives were ahead in Alberta and the Prairies, but only made gains since July in Atlantic Canada and the Prairies. The New Democrats were down in the Prairies, Ontario, and Atlantic Canada, but were up in B.C., Alberta, and Quebec (significantly so, there). The Liberals have re-taken the advantage in the seat count, and would likely win 134 seats with these numbers. That is up 17 from July, when they had placed second (yet first in the polls). The Conservatives were down 10 seats to 125, while the New Democrats were up 25 seats to 75 and the Bloc Québécois was down 32 seats to only two. The Greens were unchanged at two seats. Quebec is obviously the big change, as the Bloc fell from 26% and second place to 18.3% and a distant third. That swung 32 seats over to the Liberals and NDP, with the New Democrats reaping most of the benefits (they were up 29 in Quebec, the Liberals were up four). Elsewhere, the Liberals made big gains since July in Ontario, up 11 seats, while the Tories were down eight. Other than that, only a seat or two changed hands compared with July. A six-point lead is certainly good news for the Liberals, and as we have seen their seat potential in Quebec might be under-estimated. That still puts them squarely in minority territory, though, and the Liberals would need to take some huge strides forward to put them over the 169-seat mark. That seems unlikely in the short term, though for now it appears that Justin Trudeau's honeymoon is continuing. Whether the honeymoon will end remains to be seen. As I mentioned in my Globe article last week, Michael Ignatieff was still leading in the polls at about this point in his leadership, while Stéphane Dion had already given up the lead. So being ahead is not unprecedented, and also not (yet) a positive sign. But Ignatieff and Dion did not manage to consistently put up leads the size of Trudeau's, and that was in an era of the NDP polling in the mid-teens. Trudeau is on a slightly different path than his predecessors - at least so far. The Corporate Research Associates released their latest numbers for the provincial scene in Nova Scotia, showing that Stephen McNeil's Liberals still hold a significant lead over Darrell Dexter's New Democrats. But the numbers might not work very well for McNeil, as the Nova Scotia projection now puts him in a position to win only a minority government. The vote projection is almost entirely based on the latest CRA poll, the only real difference coming from their May survey (taking up a whopping 0.4% of the projection) and the model's estimate of support for other parties and independents being 0.7% (rather than the 0% of CRA). So, the vote projection has moved exactly like CRA's latest poll: a four-point drop for the Liberals and a five-point gain for the NDP. The seat projection has moved more dramatically. The Liberals have slid six seats in the projection to 22, putting them four seats short of a majority government. The NDP gained seven seats to reach 20, while the PCs were down one seat to nine. Nevertheless, the Liberals are still in the better position as they have only dropped three seats in their likely result. They had been projected to take between 24 and 33 seats with CRA's May numbers, and they have since slid to between 21 and 30 seats. That puts them well in range of a majority government, and with the NDP's most likely range moving to between 20 and 22 seats Dexter's odds of victory are slim. That is, if the polls are off by only an average amount. If the polls miss the call as wildly as they have in some recent campaigns, then an NDP majority is certainly possible (it was not considered possible when they trailed by almost 20 points - polls are never that wrong). Their maximum seat haul is 33, assuming enormous error in the polls. If it goes the other way, however, they could be reduced to 11 seats and perhaps displaced as the Official Opposition by the PCs. The Liberal vote is simply not very efficient, and with CRA's polling showing the two parties neck-and-neck in the Halifax region the race is very much undecided. Particularly considering that 41% of respondents to CRA's poll were actually undecided. That is a huge number, but nothing unusual for CRA. It has actually dropped two points from their last poll. Whether it is something that really needs to be of concern, however, is another matter. As Don Mills explained in an interview with me, CRA does not include 'leaning' voters in their polls outside of campaigns. That has the potential to inflate the size of the undecided vote considerably. CRA found the Liberals to have fallen to 41% while the NDP had risen to 31%. That five-point gain was just outside the margin of error for decided voters, whereas the Liberals' four-point drop was just inside of it. The PCs slipped one point to 25%, while the Greens were unchanged at 3% support. For the New Democrats and Liberals, this puts them back to where they were between August 2012 and March 2013. The PCs, meanwhile, have been stuck at around this level of support for years. McNeil topped the leadership table with 30% saying he would make the best premier, compared to 19% for both Dexter and Jamie Baillie of the Tories. That is generally unchanged from May. But McNeil is down from the 35% he had on this question a year ago, while Dexter's numbers are getting worse compared to his party. He had 26% support for premier in November 2012, for example, at a time when his party was at 29% support among decided voters. But in addition to the significant gain, the NDP has another small bit of silver lining in this poll. Government satisfaction rose to 42%, the highest it has been since November 2012, while dissatisfaction fell by four points to 45% - the lowest it has been since February 2012, when the NDP was polling at 44% and had a 17-point lead over the Liberals. Perhaps this suggests that those undecided voters may be satisfied enough with the government, but not yet sure they want to vote for it again. Will this be enough for Dexter to call the election? Nova Scotians still expect the call any day now. Having put his party within spitting distance of the Liberals, when before they did not have a chance at all, is a minimally positive development. The 'momentum' may falter if Dexter waits until CRA's next quarterly report to pull the plug. And as we have seen time and again, campaigns still matter. Dexter has every reason to hope he can pull off what Alison Redford, Christy Clark, and Jean Charest (almost) did, in that they were all equally on the road to defeat. Le Devoir released the latest provincial numbers for Quebec from Léger Marketing over the long weekend, showing the Liberals still leading the way but now chased by a gaining Parti Québécois. With the governing party making inroads among francophones, they are now back in a position where re-election is a strong possibility. 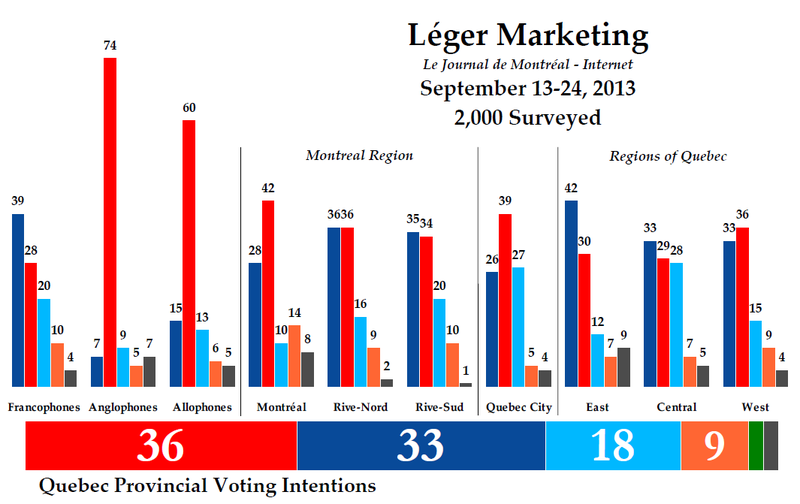 Léger was last in the field in mid-June, and since then the Liberals slipped two points to 36%. The PQ was up five points, however, to 32%. That is their best result since February. The Coalition Avenir Québec was down one point to 18%, their worst number ever in a Léger poll. Québec Solidaire dropped two points to 6% (note that they were at 11% as recently as May), while the Greens were unchanged at 3% and Option Nationale was down one point to 2%. Another 3% said they would vote for a different party, and 10% of the entire sample was undecided or gave no response (a drop of six points from June). This is an online sample, so the margin of error does not apply. But if it did, only the PQ's gain of five points would be outside of it. A 13-point gain on satisfaction with the government is certainly significant, as satisfaction has reached 39%. That is the highest it has been from Léger since the PQ formed government. Dissatisfaction was down 13 points to 57%. Important shifts in support occurred among francophones, as the Parti Québécois picked up seven points to lead with 40% among this demographic. The Liberals dropped five points to 25%, while the CAQ was up to 22%. Among non-francophones, the Liberals were up 11 points to 78% support, followed by the CAQ at 7%. Though it may be a coincidence, this PQ gain among francophones and PLQ gain among non-francophones would seem to align well with the PQ's proposed Charter of Quebec Values. An earlier Léger poll found that Quebecers were generally approving of it, and this current poll pegged the PQ as the best party to 'defend and protect Quebec's culture and values'. Fully 47% of Quebecers chose the PQ on this question, compared to 16% for the PLQ and 12% for "none of them". The gap was nowhere near as large on other questions concerning fighting corruption and the handling the environment, for example. The PLQ was ahead on the economy and employment, with 35% to the PQ's 23% and the CAQ's 12%, which is a good thing for them. If the next election is going to be fought on the economy by the PLQ and culture by the PQ, it is not clear which side would win out. The Liberals were steady throughout Quebec, leading with 39% in Quebec City and 38% in the Montreal region. They were in second in the regions of Quebec with 33%. The PQ led here, picking up nine points to reach 38%. They were up to 30% in Montreal and down to 19% in Quebec City, where the CAQ was second at 32%, a gain of eight points. The party was down to 17% in the regions and steady at 16% in the Montreal area. Québec Solidaire was at only 3% support outside of the Montreal region, and slipped to 8% in the metropolis. The party seems to be fading back to where it was on election night after flirting with double-digits since the spring. Due in large part to their advantage among francophones, the Parti Québécois would likely be able to pull more seats out of these numbers than the Liberals. They would win 61 to the PLQ's 57, while the CAQ would plummet to only five seats and Québec Solidaire would retain their two. This would actually give the PQ some options, as they could try to form a coalition or loose arrangement with either the CAQ or QS to command a majority of seats. The PLQ, however, would be less well positioned than they currently are. They would need the support or the abstention of QS to win any vote in the National Assembly, along with the votes of the CAQ. It should come as no surprise that the PQ can win more seats with a four-point deficit. In the 1998 election, the PQ was able to win a big majority government while being behind by about a point. The problem for the Liberals is their lower support among francophones. Note that when the party last won a majority government in 2008, the final poll of the campaign from Léger gave the PLQ 36% support among francophones. They are a long way from there. But Philippe Couillard does have some time before the next vote - everyone expects it in the spring, but with the CAQ polling at an all-time low there seems to be little incentive for François Legault to pull the plug.